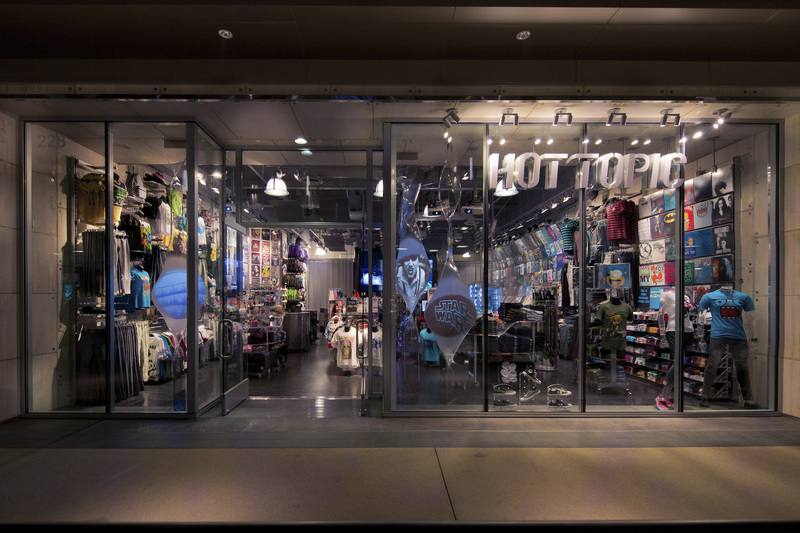 At Hot Topic it’s “everything about music and pop culture,” and this evolution of the store environment is no exception. The objective was to create an environment that mirrors the world of the typical Hot Topic customer by connecting social and technological components into the shopping experience. Created by a collaboration between Hot Topic, CRI and JGA, the character of the store is technical, sleek and transparent. Cast acrylic, molded metals and media technology lend to the store’s high-tech feel. This evolved prototype is feature-rich interactively, from the access to online music listening, to stations where shoppers can co-create micro-manufactured tunes as well as create their own designs for t-shirts. The store also reflects a “takeover” capability, where the environment can be modified to accommodate live music performances in the space. Non-selling space can also be adapted to serve as a pre-staging area for bands to prepare for Hot Topic gigs.